This was a pinkish powder that after adding water would turn into pink goo. 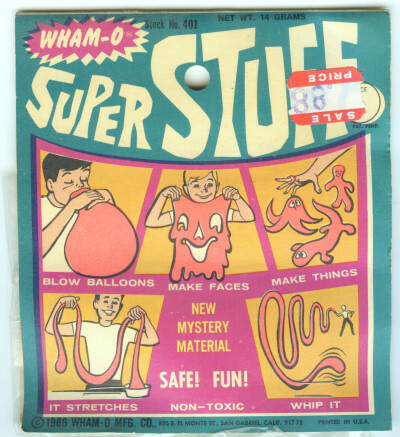 Wham-o also made Super Elastic Bubble Plastic, Frisbee, over-sized soap bubble wands, Super Balls and more. 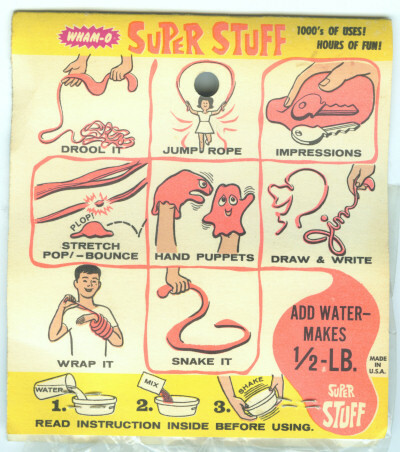 I remember Super Elastic Bubble Plastic for the groovy colors and the heavy duty smell. Woo! It came in a tube and you squeezed out a wad and attached it to the end of a hard plastic straw (also included). Then you blew psychedelic bubbles, man. When they popped it became Super Sticky Bubble Carcass.